When assembling, we lube the speed-drive with a basic quantity of MoS2-grease, which is good for at least 2'000 - 3'000 miles. Indeed, if you are interested in the highest possible efficiency, you can lube the speed-drive yourself from time to time. The speed-drive - sealing has very low pressure to avoid friction losses. Therefore, it is not designed to keep an oil bath within the gear housing. Excessiv lubrication may result in a loss of oil. This is no functional problem, but please take care, if you transport your bike within your car. After several thousand miles, please check for bearing play. The chainring must not have any play along the spindle axis. 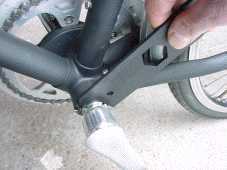 If there is any play, slightly tighten the self-locking nut on the left end of the axle. Never tighten the nut too firmly. Some play between the cranks and chainring in the direction of crank rotation is normal and necessary for proper engagement of the gears after switching. If ever required, each speed-drive can easily be disassembled without any special tools. Although there are only few parts inside the gear housing, you shouldn't make anything on it, if you are not familiar with bicycle technique. Please consider, that the 1-years warranty expires due to improper operations on the speed-drive.